It's now nearly two weeks since our return to the UK, and we are still basking in the warm glow of the memory of our wonderful stay at Kontoyiannis House, and wishing we were still there amidst the vines, plants and flowers. and is a reflection of your care and concern (special thanks to John for all his friendly visits!). The village is simply perfect and the villagers so friendly and welcoming. We so enjoyed just 'being there', as well as the location being ideal as a base for exploring the glories of the island. Thank you for making our holiday one to remember and treasure, and we are looking forward to coming back to Kalavasos in the future. With our sincere thanks, and warmest best wishes. The apartment at Kalavasos was great. Well furnished. clean, neat and very tidy. The village of Kalavasos is quaint, and very romantic. Perfect for a honeymoon get away where you will not be disturbed by bellboys or friendly hotel staff. Definitely need a car to reach Kalavasos, and also to get around. to arrive and remain in Kalavasos for several days may not be such a good idea. taxis are fairly expensive, so renting a car is a good option. Knowing that it was not a hotel build, but merely a conversion of a house does mean that there is less impact on the village. Unfortunately we could not give back that much to the village as we would have liked to. We had dinner in the village once which was nice. The hairdresser was fully booked or closed. Overall to know that I have paid money to an entrepreneur, a person of the country, instead of to a hotel chain or conglomerate, pleases me immensely. I think I would rather have a holiday like wherever I go, instead of into a hotel group. We spent 4 days in Kalavasos, which was great. Four stars for sure. Just wanted to let you know how much we enjoyed our stay. We found the location to be convenient to everything, while avoiding the ultra-touristy areas. 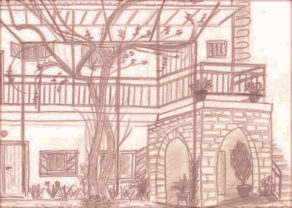 The house itself is great; we loved the courtyard and grape vines and other plants. We also enjoyed meeting the other guests, and walking to the village square. One of our guests so enjoyed their stay here in Cyprus they decided to buy their own land and build. 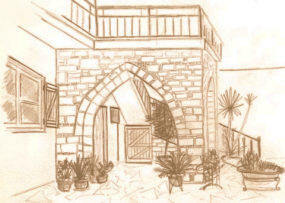 Below are some sketches from their holiday that were sent to us. They have very kindly allowed us reprint them here. Thank you Peter. After some persuasion from our sons and daughter -in-law, we eventually visited Cyprus, staying for the whole of January 2006. We so enjoyed the Island, the hospitality of the Vassiliou family and the friendliness of the residents of Kalavasos we returned during May/June. We now own a plot of land and we are building our permanent home near-by with a courtyard. 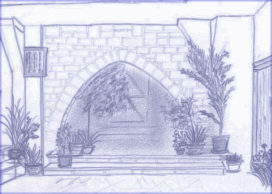 The courtyard at Kontoyiannis House was the venue for Canasta sessions most evenings or for very enjoyable Bar-b-ques. The local Gilt Head Bream being superb. 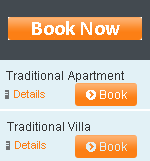 The accommodation at Kontoyiannis is based on several spacious flats which have been modernized recently. I had intended to write to you immediately after our stay at Kontoyiannis House from the 23rd of April until the 3rd of May this year, but then the daily routine took over too quickly. However, I would like to let you know how much my husband and I enjoyed our visit to Cyprus and our stay at Kontoyiannis House. It was such a nice and relaxing holiday. For a long time we won't forget the swallows rushing through the air, the beautiful courtyard with its peaceful atmosphere and our relaxing evenings on the balcony with a good glass of Cyprus' wine. Your family really has created a little paradise. Please send our regards also to your husband. I just wanted to drop you a quick email to say thank you for a very enjoyable stay at Kontoyiannis. We really enjoyed the peace and quiet - a welcome escape from our busy work lives! Hope to see you again at some point in the future. Most sincere apologies for not contacting you sooner. I had problems with my broadband e-mail system (I upgraded to broadband at the end of May) and have already tried to send three which I know did not arrive. Thank you so much for the wonderful twelve weeks in Καλαβασσός from which I have barely recovered. It will be difficult for me to forget that holiday which I enjoyed so much, the peace, the friendliness and courtesy of the people. I had thought that this long spell might be the last but my thoughts are constantly brought back to Cyprus and I shall keep an eye on your web site and if possible make arrangements for another peaceful holiday in idyllic Καλαβασσός. I must also thank you for the recipe which I tried and enjoyed and also for the γλυκά which was thoroughly enjoyed by Elena's family. Thank you again for a wonderful holiday and may I send my regards to all your family. Just a quick note to say how much we enjoyed staying in your house at Kalavasos. Originally we planned to stay only a week and then move on. However we found your flats so good and the position of Kalavasos so central that there was no reason to seek anywhere else. It was twenty years since I was last in Cyprus and then only for two separate week-ends. How much the main towns had grown. Thank you also for arranging the car which was equally good. Sorry we did not have the opportunity to meet you. Subject: KONTOYIANNIS / KALAVASSOS A WONDERFUL WEEK. We felt it would be nice to drop you a little note just to say how much we both enjoyed our too short a stay at 'Kontoyiannis'. It is a pity we didn't stay with you for both weeks of our stay in Cyprus but we didn't know that at the time - we know better now. The second week in Coral Bay was nice but our stay in Kalavassos was wonderful, the accommodation, the location, the Village and the people were all superb and we had some great evenings with Stavros at the Taverna. Unfortunately we have already booked to go to Lesvos in the autumn but if we venture back to Cyprus next year we will be sure to check to see if you have vacancies first - for two weeks this time. Once again thank you both for everything and who knows when we will meet again. we had a lovely time, I felt so relaxed while we were their. The holiday went so quick, now we are back in Germany, and its bucketing down with rain. hopefully see you again in April, It will be just me and the kids. Thanks very much for the lovely accommodation in Kalavassos. I had a very pleasant time and it was good to meet the family and locals and have fresh oranges for breakfast. The lady at the little grocery shop was very kind to me and would not let me leave without offering me some extra vegetables. I stayed the next few days in Pissouri and then on to Pathos so I had a reasonable flavour of the Island by the time I returned but I am particularly happy that I spent the majority of my time in Kalavassos.